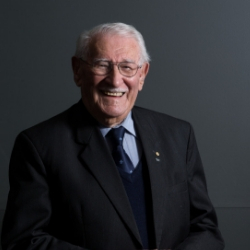 Eddie Jaku OAM, born Abraham Jakubowicz in Germany in 1920. His family considered themselves German, first, Jewish second. On 9 November 1938, the night immortalised as Kristallnacht, Eddie returned home from boarding school to an empty house. At dawn Nazi soldiers burst in, Eddie was beaten and taken to Buchenwald. Eddie was released and with his father escaped to Belgium and then France, but was again captured and sent to a camp, and thereafter to Auschwitz. On route, Eddie managed to escape back to Belgium where he lived in hiding with his parents and sister. In October 1943, Eddie’s family were arrested and again sent to Auschwitz where his parents were both murdered. In 1945, Eddie was sent on a ‘death march’ but once again escaped and hid in a forest eating slugs and snails until June 1945 he was finally rescued by. Eddie has volunteered at the Sydney Jewish Museum since it’s inception in 1992. Self-proclaimed as ‘the happiest man on earth’, he saw death every day throughout WWII, and because he managed to survive, made a vow to himself to smile every day. Edie has been married to Flore for 73 years, they have two sons, grandchildren and great grandchildren.